#FIBAOQT Semis: Canada vs. New Zealand Full Video and Results (July 9, 2016) - Balita Boss! 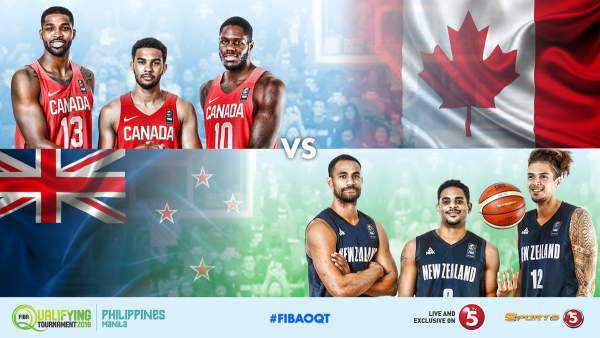 Canada faces New Zealand in the semifinals of the 2016 FIBA Olympic Qualifying Tournament in Manila. The winner of the Canada vs. New Zealand match-up will play the winner of the other semifinal between France vs. Turkey in the Finals with a ticket at the 2016 Rio Olympics at stake. Canada swept its Group A assignments by defeating past Turkey 77-69 and surviving Senegal's challenge 58-55. New Zealand, which fell to France 66-59, defeated host Philippines in their first game 80-89 to advance to the semifinals. Toronto Raptors point guard Cory Joseph has been the leader for Canada basketball national team. He averages 17.0 points per game, 4.0 rebounds and 3.5 assists in the 2016 FIBA OQT. Other key players for Canada include newly-crowned NBA champion Cleveland Cavaliers center Tristan Thompson and Tyler Ennis of the Milwaukee Bucks. Thompson averages 8.5 points, 8 rebounds and 2 assists, while Ennis averages 9 points, 2 rebounds and 2.5 assists. For New Zealand, the team leaders in this tournament are forward Corey Webster, who has 22 points per game, his brother Tai Jack who averages 17 points, 9.5 rebounds and 2.5 assists, and Isaac Fotu who averages 12.5 points, 7.5 rebounds and 2.5 assists. Canada versus New Zealand will be broadcast live on TV5 and HYPER on CIGNAL in the Philippines. You can also watch the 2016 FIBA Olympic Qualifying Tournament semifinals Canada vs. New Zealand live streaming via livebasketball.tv.